Downstairs at Caius House in SW11 there was an exhibition of organisations and equipment vendors who help dyslexics and people with other challenges. The team behind Irlen glasses – which assist people who have reading problems due to imperfect colour vision, and the C-pen which scans and reads information, were there. The next speaker was Jasmine “Jazzy” Hearts, a 13 year old dyslexic, bullied at school, who has become a speaker and ambassador for dyslexia. Many people in the audience identified with her struggles as schools can be very cruel places to anyone who seems a bit “different”. She uses her gift for speaking to help other people now. Councillor Ian Lewer, the Deputy Mayor of Wandsworth Council, who came out publicly as dyslexic at last year’s event, said he was lucky enough to be diagnosed early and got special schooling, and extra time in exams which enabled him to start on a successful career. After a food break the second session started with a non-dyslexic, Jannette Morgan, who supports people with dyslexia, who amazed the attendees by giving her speech in poetry. It was hard for anyone to follow that. 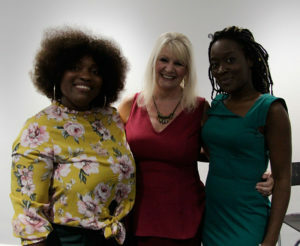 Pennie Aston, the Founder of GroOops dyslexia charity and Gaby Holford a nutritionist and healer gave presentations on different aspects of having a positive lifestyle. Gershom J. Allen is a very forceful speaker who says “It is all about accepting who you are, before you can become” (that is, who you want to be). His journey took him from being beaten at school in Montserrat for not being able to read, to working his way up in a factory from sweeping the floor to supervisor. “Every person with dyslexia has a gift. There are special people that are meant to do great things.” He became a coach, and a motivational speaker, like his heroes such as Tony Robbins. 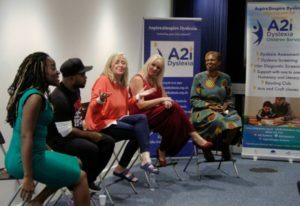 Many of the speakers were quite candid about their struggles and the psychological pain of undiagnosed dyslexia, although it does seem that schools are getting better at spotting this early on and getting help to those who need it. Overall it showed that many dyslexics find a different path in life – using their artistic, verbal, intuitive or empathic skills to benefit themselves and wider society, and that dyslexia can be a “gift” rather than a handicap.